We’re getting inside the C+A family to find out what makes our team tick. Starting off with Zoe Sayliss our marketing intern, we’re developing an interview series where we’ll get to the core of our wonderful team and explore how our mission to reinvent recruitment transpires with each and every one of us. 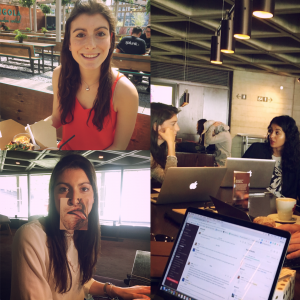 In August we welcomed Zoe Sayliss into the C+A family as our marketing intern. As a serial sportswoman who previously competed in Tough Mudder, synchronised swimming and now training for a half marathon Zoe brought along a well received hunger to thrive with her. She had a strong passion for a future in marketing and was eager to find a place to hone her skills and learn more about the industry. C+A soon became the perfect fit. With our unique recruitment marketing strategies and employer branding structures, Zoe found a place with us where she could experience and learn about our modern and proactive approaches to recruitment marketing in real time. Sitting down with Zoe we delved into her experience with us and her views on the future..
How would you describe your experience with us.. It was an absolute delight to be able to inspire, attract and grow with Zoe on board. Her experience with us as a marketing intern highlights our core values on challenging the norm, continuing to expand our knowledge and embracing individualism, so as a team we grow stronger. Our next instalment will feature another member of the talented C+A family so stay tuned for more insight into our team! To read more insights into our team click here.